Your home is your most valuable asset. Protect it! Experts agree the most effective basement waterproofing method is an interior sub floor system. 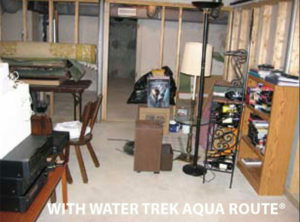 The Water Trek Aqua Route® is the best product available. Eagle Associates is an official dealer and installer of Basement Technologies’ Water Trek Aqua Route® basement waterproofing system. 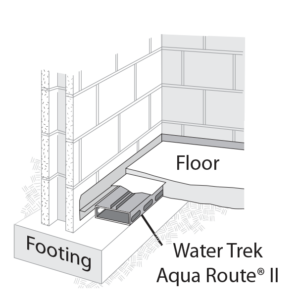 The Water Trek Aqua Route® system is a unique patented system that can be “custom tailored” to each basement water problem and footing configuration under the floor. It addresses water from both sides of the footing and can be installed in any soil or sub-floor situation. Research has shown that water can enter your basement from in front of the footing as well as from the footing/foundation wall seam. That’s why the Water Trek Aqua Route® conduit has slots on both sides to drain both problem areas. 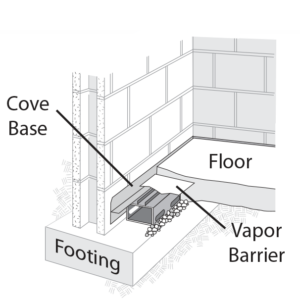 Soil composition and the configuration of footing, wall, and floor can vary greatly from house to house, and is virtually impossible to analyze until the floor is opened, yet identifying your home’s footing configuration is key to installing a waterproofing system that will last. Our experts will ensure your basement stays dry forever. 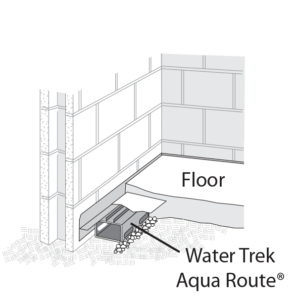 The patented Water Trek Aqua Route® system is engineered with two unique components to address any sub-floor problem with a “custom tailored” solution leading to effective basement waterproofing. This exclusive, versatile, “no-clog,” adjustable depth system delivers a peace-of-mind permanent solution to your basement water problem and fits all possible footing configurations. 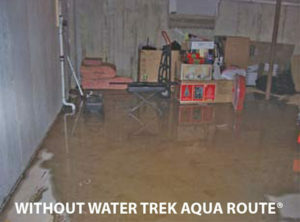 The Water Trek Aqua Route® is able to adjust to your home’s footing configuration because of its two-piece system. 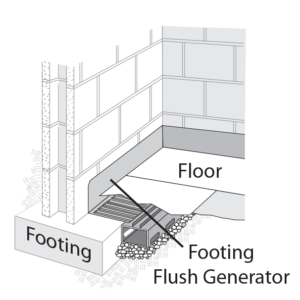 The various designs hug walls and channel water from both the wall above and the footing below into the sub-floor system. It can create a virtual airtight fit on most, if not all, foundations. This blocks the entrance of radon gas, sub floor smells, or insects into the living space. We also have five different Cove Base options, each designed to be custom tailored to your basement. After installing a full perimeter Water Trek Aqua Route® system, you can be confident in your basement — it’s warrantied to stay dry forever. The standard Water Grabber® Bull Dog™ top discharge. The Water Grabber® Bull Dog™ with optional side discharge. The water collected by the Water Trek Aqua Route® perimeter drainage system must go somewhere. Our Water Grabber® Bull Dog™ pumps it out of your house quietly and efficiently, where it enters your lawn through the Bubbler Pot. This system is protected by the patented Freeze Stop® which will prevent ice from blocking the pipes. Floor gate at bulkhead door ties into the system. Ask us for more information about our other great basement waterproofing products! Over 30 Years of Quality Service. Call us today at (518) 756-6531.